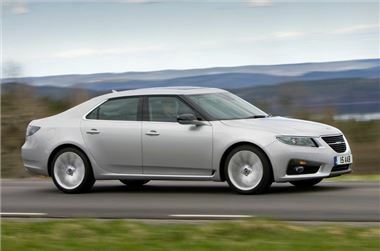 Two months after the Saab 9-5 was launched, Saab is introducing two new engines to the line-up in the shape of a twin turbo 2.0TTiD with 190bhp plus a 1.6T petrol with 180bhp. There have been other changes too with the introduction of Adaptive Cruise Control (ACC) as an optional extra and new paint colours. The 2.0TTiD features twin turbos to deliver 400Nm of torque from as low as 1750rpm along with 190bhp and as a result can accelerate from 0-62mph in less than nine seconds. Claimed fuel economy is good at 47.1mpg plus CO2 emissions of 159g/km, keeping the 2.0TTiD below the 160g/km write down threshold for company car buyers. The 2.0TTiD engine is available in Vector SE and Aero trims and can be specified with cross wheel drive (XWD), combining diesel power for the first time with Saab's all-wheel-drive system. All variants are equipped as standard with Saab's linked H-arm rear suspension system, designed for greater ride comfort and to reduce vibration in the cabin. The new 1.6T petrol turbo delivers 230Nm of torque and includes an overboost function for extra power when overtaking (for instance) and enables a 0-62mph time of 9.5 seconds while claimed fuel economy is 36.2mpg and CO2 emissions are 179g/km. The 1.6T is available in Vector SE specification with front wheel drive and a manual transmission. The options list has also been expanded with the additions of Adaptive Cruise Control (ACC) with Stop & Go. Available on models with the automatic gearbox it enables the driver to select a constant cruising speed and automatically alters the chosen speed to maintain a safe gap to the vehicle on the road ahead. Full distance control is provided from 112 mph down to a complete standstill. The driver can select one of three distance options. A radar sensor in the front grille emits a beam to measure the distance to the vehicle in front. If this gap reduces below the required setting, the throttle opening is adjusted or engine braking is applied. Once the appropriate distance is restored, the car will accelerate back up to the pre-set speed. Should heavy braking be required, a visual warning is flashed and an audible sound alerts the driver to take action. ACC, available later in the model year, requires the fitment of Saab's head-up display. Click here to read our 2010 Paris Motor Show A-Z guide.